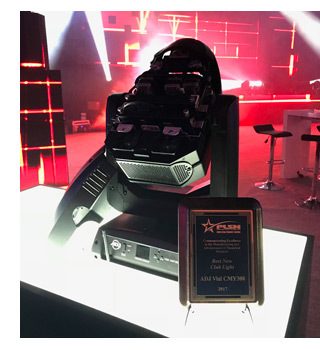 This past weekend at LDI 2017 (Live Design International) in Las Vegas, Nevada, ADJ Lighting received the PLSN Gold Star Product Award for Best New Club Light for the company’s new Vizi CMY300 hybrid moving head with CMY color mixing. 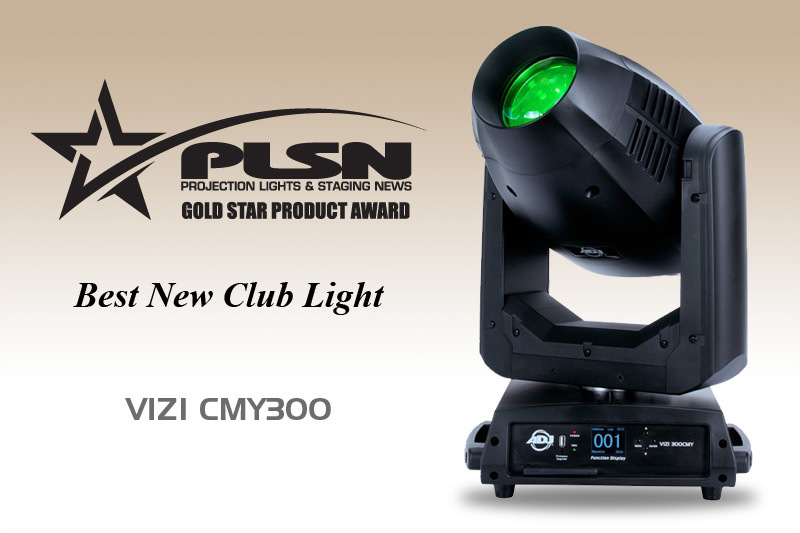 The PLSN Gold Star Product Award for ‘Best Club Light’ was given to the ADJ Vizi CMY300 moving head by PLSN Magazine’s editor Nook Schoefeld during the LDI 2017 tradeshow in Las Vegas. On hand to collect the award was ADJ Group President, Toby Velazquez and National Sales Manager, Alfred Gonzales. The Vizi CMY300 was introduced in September at PLASA 2017 in London as the company’s flagship moving head fixture featuring beam, spot and wash capabilities from a single moving head powered by a potent 300W LED engine with a 50,000 hour LED life. The fixure also includes a CMY color mixing system, ADJ’s built-in WiFLY EXR wireless DMX and a modular design making GOBO replacement and servicing easier than ever before. Not only does the Vizi CMY300 offer a beam, a spot and a wash from a single fixture, it also has a massive motorized zoom range from 8 to 46-degrees, motorized focusing and a motorized iris with a range of 5-100% - all controlled via 3-pin or 5-pin DMX connections. Among the extra effects that may be achieved on the CMY300 are a 3-facet circular prism and a 6-facet linear prism. Both prisms rotate and may be layered together with the fixture’s GOBO wheels. The Vizi CMY300’s color wheel offers 9 colors plus open. Two of the colors are UV and CTO 3200K. With the fixture’s CMY color mixing systems, designers can pick thousands of custom colors by mixing the cyan, magenta and yellow color flags. ADJ has included its proprietary WiFLY EXR wireless DMX on-board that transmits and receives a DMX signal from up to 2,500 ft./700M away (line of sight). The built-in WiFLY is a great benefit for users who need to control the fixture without long DMX cable runs from far distances such as stadiums or front of house venue. Another great convenience to using a hybrid fixture is the ability to transport, rig and control less fixtures, and allows for lighting users to purchase less fixture but offer more flexibility with a beam, spot and wash along with the CMY color mixing. The Vizi CMY300 opens doors to a new group of lighting designers, rental houses and installers with a price tag of US $2,999.99 - a price not available in other fixtures in its class. The Vizi CMY300 will be available worldwide in December 2017.